Getting the old girl ready for one last shot at Speed Week in August. Have a new BW Turbo from my sponsors BW and Area Diesel Service in Carlinville Il. Turbo is an S400SX3 with an 82mm compressor and an 87mm turbine in an FRP ported 1.25 A/R housing. I have a new set of my FRP Race Gas / E 85 pistons in it with a special ring package that uses a PVD coated tool steel top ring and my usual Gapless seconds from Total Seal and a standard NPR oil ring. The top ring has an extra deep .176 radial dimension and is .0415 thick as apposed to the 1mm top ring I had been using. I have to run a greatly reduced top ring land diameter to keep the crown of the piston off of the cylinder wall at mile 4 - even with the ceramic coating on the crown. There is just too much heat soak in the extreme B Ville environment. So the deep radial dimension of the new top ring is to make up for the lost top land support. I have also changed the cam timing for an even wider lobe separation angle with the exhaust advanced 2 degrees to a 115 centerline. This spools the turbo sooner and harder which will help with the thin air at 4000 ft. elevation. 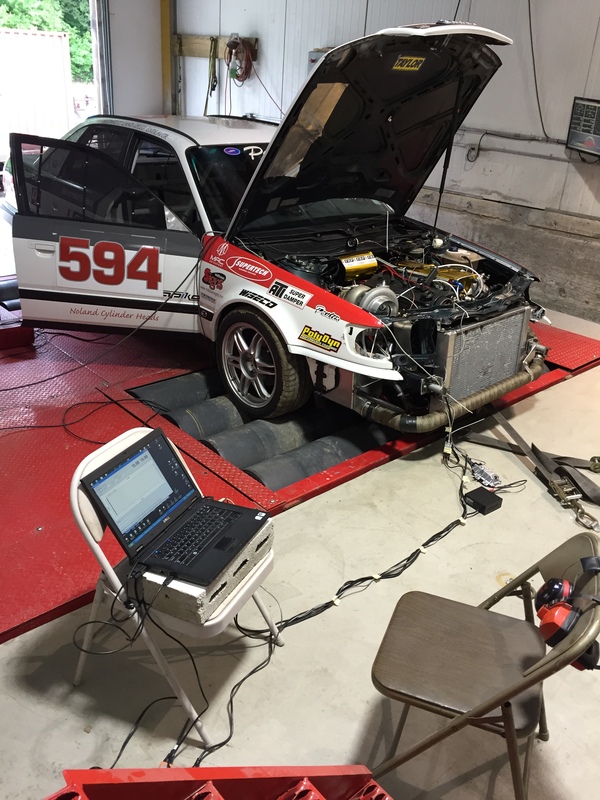 Also new this year was our trip to Kansas City's "heart breaker" Mustang chassis dyno at KC Engines. We had always been on a DynoJet before so I was a very curious to see what numbers the eddy current dyno would give us.. The session went great with Brendan Rudack doing his usual masterful job tuning the Stage 2 C.
We monitored back pressure in the collector and vacuum / pressure in the crank case This was very rewarding as back pressure at the turbine entrance never got close to 1 to 1 and the ring package worked so well that 6 inches of vacuum was maintained at 10K rpm and 26 pounds boost on the waste gate spring. Once we turned on the boost control and pushed boost to 33 pounds the crank case gage would just barley creep towards zero by 10,300 RPM. Since I am only running 2 scavenge stages on the dry sump and only start with 6 inches of vacuum that is some kind of ring seal! Very Happy. 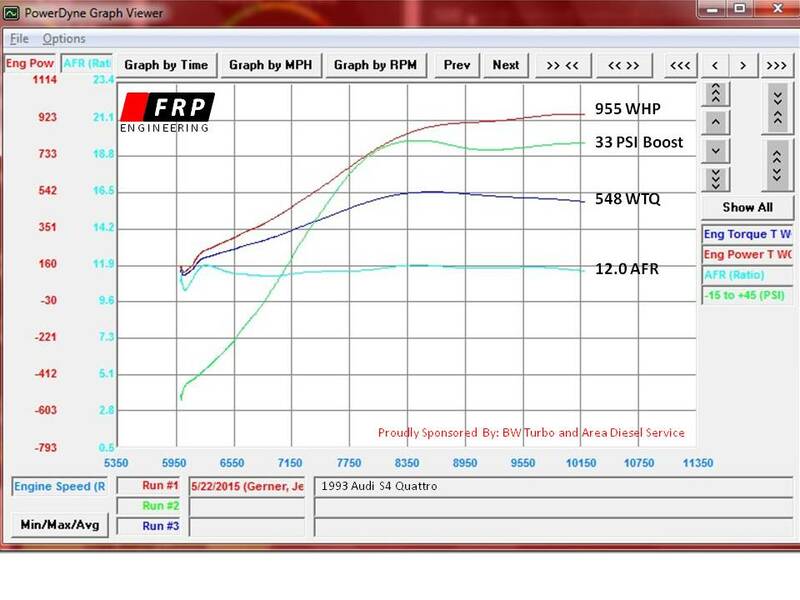 Anyway she made 955 WHP and 548WTQ on the Mustang dyno. The dyno operator said the only other vehicle that had made that big a number was a twin turbo Chevy LS motor in another guys toy - it made right at 1100 wheel with 6.2 liters of displacement. 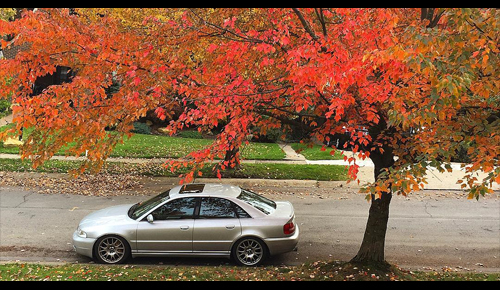 The Audi is just 2.3 - Ha! Now I will be adding more ballast to the car and resetting the corner weights. I think it has a chance for a record near 260 mph. Just don't want it try to imitate an aircraft of some kind. Wish me luck! I'm tempted to try and come out to witness the run. My Aug could be busy though. That is spectacular! Best of luck this year Jeff. I can't wait to see more! Best of Luck! Will also be watching closely! As always, love the technical details of your approach. This thing absolutely screams on the dyno!! In my current airplane, our rotation speeds are in the 150moh range and that's a max takeoff weight of a little better than 85,000 lbs. 260 plus in a practically stock bodied 3500lb (???) urs4 is a takeoff waiting to happen! As we say in aviation-take offs are optional, landings are mandatory! Good luck, Jeff! I always watch your project with rapt excitement! Jeff, would you be running on the 8th and 9th of August? I will try like hell to be there with Matt. indeed. I'd fly out for this to join the fan club. Just spoke with Jeff, speed week is the 8th-14th of august. hotel rooms go for balistic money, the smart plan is to rent an RV and camp out. I have to work, otherwise I'd be so down! 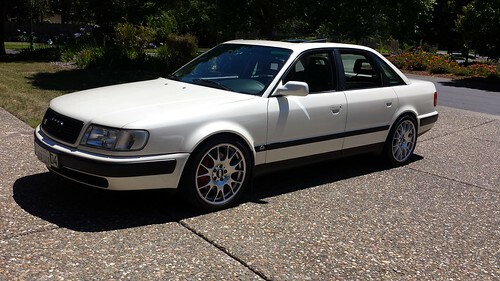 Nice car,awesome work and cool Articles.By the looks of things you will be setting that Record. But good luck to you anyways. Hey guys, just a quick heads up that Jeff could really use our help. Some unexpected replacement parts have been necessary to get the car ready for the event. As you can imagine this is already an increadibly expensive endeavor for him. I've setup a gofundme page at his request. who's in? That's a no upon closer inspection. Maybe the better question... how much to get my name on the car? I big fat thank you to all of you so generously helping out! FRP wrote: I big fat thank you to all of you so generously helping out! Wish I could've donated more! The time and effort that you've put into sharing your knowledge on engine building here is worth every penny and then some.